David Levy observing at the Jarnac Observatory. David H. Levy (born 1948) is the founder of the National Sharing the Sky Foundation that is devoted to increasing awareness of astronomy through public outreach. Levy is best known for his comet discoveries and for his many books and articles on astronomers and astronomy. Levy was born in Montreal, Canada on May 22, 1948. He developed an interest in astronomy at an early age. However, he pursued and received bachelor’s and master’s degrees in English literature. In 1967 he was nearly expelled from the Royal Astronomical Society of Canada's Montreal Centre after a disagreement with some members of its administration. "Levy will never amount to anything," one senior official of the RASC remarked in 1968. Years later, Levy began a correspondence with Isabel Williamson, the person most responsible for his near-ouster. These letters turned into visits, the presentation of the National Service Award to Miss Williamson, and the naming of the Montreal Centre's Observatory after her. Levy went on to discover 23 comets (9 of them were visual discoveries), either independently or with Gene and Carolyn S. Shoemaker. He has written 34 books, mostly on astronomical subjects, such as The Quest for Comets, the definitive biography of Pluto-discoverer Clyde Tombaugh in 2006, and his tribute to Gene Shoemaker in Shoemaker by Levy. He has provided periodic articles for Sky & Telescope magazine, as well as Parade Magazine, Sky News and, most recently, Astronomy Magazine. Periodic comets that Levy co-discovered include 118P/Shoemaker-Levy, 129P/Shoemaker-Levy, 135P/Shoemaker-Levy, 137P/Shoemaker-Levy, 138P/Shoemaker-Levy, 145P/Shoemaker-Levy, and 181P/Shoemaker-Levy. In addition, Levy is the sole discoverer of two periodic comets P/1991 L3 and P/2006T1. He is also the first to discover comets visually, photographically , and electronically. On February 28, 2010, Levy was awarded a Ph. D. from the Hebrew University of Jerusalem for his successful completion of his thesis "The Sky in Early Modern English Literature: A Study of Allusions to Celestial Events in Elizabethan and Jacobean Writing, 1572-1620." David and Wendee live in Vail, Arizona, home of the Jarnac Observatory. 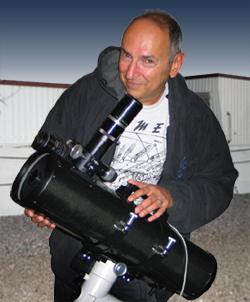 David Levy is a prolific speaker, writer, and public astronomy outreach enthusiast, where he and his wife Wendee Levy are often involved in showing the public the night sky. Levy is available for personal appearances and lectures. This page has been accessed 29,144 times.